ooking for some decorations for 20th birthday party or anniversary celebration party ? 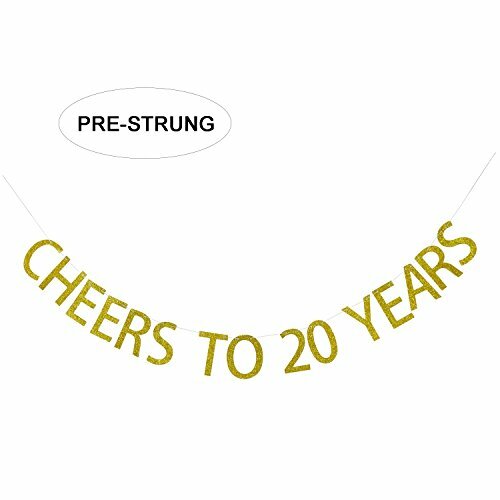 Here this adorable “CHEERS TO 20 YEARS” banner would be a good choice for you. The banner can be used many times thanks to its premium material, you can have it for keepsake or give it to your friend or colleague to make best use of it. It also folds easily for storage. The length is about 3 meters, this allows you fix the banner anywhere easily, and you can adjust the gap between the letters freely. As the banner has been pre-strung for you, please unfold it carefully, or you may damage the letters. If you are not happy with your purchasing, free to contact us, we will give you full refund. Perfect for 20th birthday party or anniversary celebration party, add some classy touch to your event. This cute banner is not only a perfect decor, but also a good photo props with its nice cut outs. NO DIY NEEDED: this adorable banner comes assembled and ready to hang, just take your time to prepare the party. Material: made of high-quality gold glitter card stock, very very sparkly , it will be a hit at your party and you will receive countless compliments. Size: the letters are approx 5.3" tall, and the width may varies for different letters. About 3 metres long of the attached rope, this perfect length allow you to fix the banner anywhere you like . If you have any questions about this product by Partyprops, contact us by completing and submitting the form below. If you are looking for a specif part number, please include it with your message. Gold Decorations Kit,Star Paper Garland,3D Stars Party Decor,Metallic Bunting Banner--Holiday Supplies,Birthday,Wedding,Baby Shower,Hanging Decorations for Nursery,Kids,Girls Room By PinkBlume(4 Set).